The DMNG RACK180 provides broadcasters with a powerful encoding solution for live newsgathering applications, enabling them to cost-effectively capture and deliver HD video content in real time over multiple networks, including 3G/4G cellular wireless networks, Wi-Fi, Ethernet, and satellite. 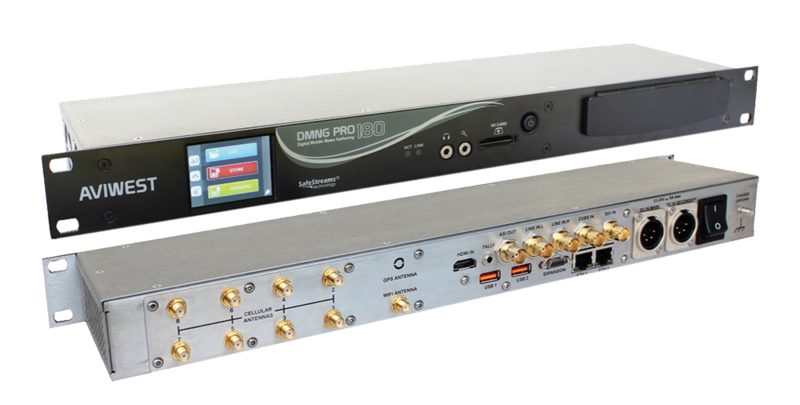 The DMNG RACK180 features the same powerful hardware and software core as the industry-leading DMNG PRO180-RA, including eight 3G/4G modems, a built-in Wi-Fi modem, and two best-in-class H.264 video encoders, all housed in a compact 1RU chassis that is easy to integrate into newsgathering vehicles. The DMNG RACK180 has 8 SMA antenna connectors on its rear panel to plug 2 AVIWEST QUAD wideband external cellular antenna arrays that can be easily installed on the roof of vehicle. The QUAD antennas are designed to strenghen the signal transmission in critical environment such as live from crowed areas. The DMNG RACK180 features an average power consumption of 30 watts and maximum power consumption of 42 watts. By providing operators with a low-power, broadcast-quality encoder, the DMNG RACK180 lowers overall capital and operating expenses. The DMNG RACK180 has several video inputs (HD/SD-SDI, HDMI 1.3, composite video, and analog audio) and other interfaces including an ASI-MPEG-2 transport stream output, two Gigabit Ethernet outputs, two USB-2 ports, plus an SD memory card slot for maximum flexibility in the field. The DMNG RACK180 can stream over KA band and use cellular links as back-up or complementary connection. It enables starting streaming a live over cellular connections while driving to location, before switching to KA band once the satellite dish is pointed. This bonding mode also ensures the transmission reliability when the performance of the KA band decreases, particulary in case of bad weather conditions or of drop in bandwidth due to congested network. The DMNG RACK180 has 8 internal 3G or 4G modems, an internal Wi-Fi modem plus 2 Ethernet ports to stream a live video over bonded IP networks to a DMNG StreamHub. Combined with two QUAD wideband cellular antenna arrays, the DMNG RACK180 can stream live footage even in critical conditions such as from crowded areas.